Renfrow Farms has pure, raw honey for sale in multiple sizes. We have several dozen hives located two blocks from Renfrow’s at our “in-town” farm. Our millions of bees are the hardest workers on our farm, pollinating so many of our crops and making thousands of pounds of honey each year. Do you have seasonal allergies? Some doctors recommend eating local raw honey to help cut down on allergy symptoms because it has small amounts of pollen in it that your body can fight off, helping build up immunity against the pollen that irritates your body during the changing seasons. We harvest our honey at four different times each year: Early Spring, Late Spring, Summer, and Fall. This creates four distinctive flavors that reflect the nectar of the flowers that change with each season. 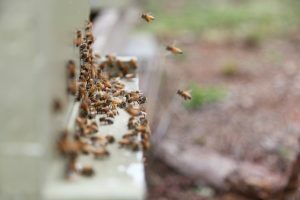 Our downtown Matthews hives produce honey that is central to the Matthews, Stallings, Mint Hill, Indian Trail, Charlotte, Pineville, Waxhaw, Monroe, Indianland, Midland, and Marvin areas.